In a disaster situation, one of the largest concerns is not if, but when to evacuate. Go too soon and you risk leaving your home and possessions unprotected, and possibly rack up a hefty hotel bill. But if you wait too long, you are making a mass exodus along with thousands of other people. In some types of disasters, like wildfires or hurricanes, evacuation orders may be issued by the local government. When this happens, some people devolve into a state of panic due to a complete lack of preparedness. 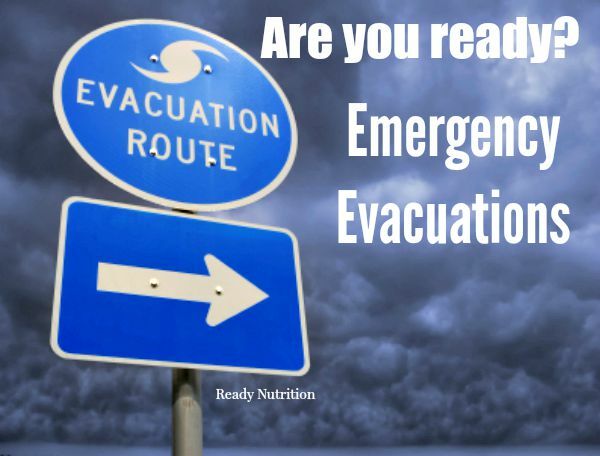 As discussed with examples of evacuation scenarios in my book, The Prepper’s Blueprint , if you have a plan in place for such an event, it can save stress, time, money, energy, and sometimes even a life. According to FEMA , evacuations occur far more frequently than we realize. Hundreds of times each year, transportation and industrial accidents release harmful substances, forcing thousands of people to leave their homes on a moments notice. Natural disasters such as fires, floods, tornadoes and hurricanes also cause evacuations. Almost once a year, people along the Gulf and Atlantic coasts evacuate in the face of approaching hurricanes. If you know what to do in the event of an evacuation emergency, you are far less likely to succumb to panic. A decisive plan of action should take into account the different variables of every situation. Create a family based emergency plan  ahead of time so that everyone knows how to handle an emergency. Make your plan flexible enough to be workable during a wide variety of emergencies. The main priorities to keep in mind are shelter, fire, water, and food. Always have Plan A, B and C – and stay focused at the task at hand. The most important part of preparing is to have a well thought out plan . This plan should be in place before you ever evacuate. When planning for an evacuation, look at your vehicle as your lifeline. Having a vehicle that is already well-stocked and evacuation-ready is your ticket to a less chaotic and stressful encounter. 2. Keep your vehicle properly maintained. That means checking and changing the oil on a regular basis, ensuring the tires are inflated, the brakes are good, the headlights work, and that the vehicle has been inspected. The vehicle that is designated as your evacuation transportation needs to be kept in optimum condition. 3. Keep your gas tank full. When my vehicle gets to half full, I typically fill it up. Not only does this ensure that I could get a long distance from my home before needing to stop, but it also saves on gas money because your vehicle runs more efficiently. Don’t forget that during an evacuation scenario, the lines to the gas stations are going to be filled with frustrated individuals who did not keep their vehicles topped up. This, paired with a high-stress scenario, could lead to altercations and delay your evacuation even further. 4. Make sure you have extra navigational items. Keep items such as GPS, maps, and compasses in your vehicle evacuation supplies. This will ensure that you know where to go and how to get there. Don’t rely strictly on your vehicle’s built-in GPS. Have non-electric navigational items, too, in the event that your GPS stops working or that you have to set out on foot. Be sure to have a smaller road atlas  that is easier to carry along with you. 5. Have multiple pre-planned evacuation locations. Road blocks, heavy congestion, and car accidents can delay your evacuation. Having plans B, or C will keep your options open. Create multiple escape routes that avoid densely populated cities. This will cut down on traffic jams. Before you leave, listen to the news to see which highways are open and plan accordingly. In addition to vehicular evacuation routes, figure out which routes that you would take if you had to abandon your car and hike out. No one wants to think about evacuating on foot, but it could be your only option in some situations. Evacuating from a home due to a fire or flood – If a home evacuation is in order, there is little time to collect belongings. Some experts  say a person has 10 minutes or less to collect needed items. Prepare a list ahead of time of the items that would need to be taken such as photo albums, identification (birth certificates, social security cards, financial documents, wills/deeds, and medical insurance information), proof of address, as well as items for a 72 hour bag . Dividing the duties between family members will make this situation more efficient as well as make better use of time. Draw a blue print of the home and then draw an evacuation route and a meeting place. Make one drawing for each story of the home. Keep this in an area of the home where members of the family can see and review often. If the home is more than one story, have an emergency ladder or rope to use as a secondary evacuation method. Have maps ready for the closest evacuation centers, main and alternative route for leaving the city in North, South, East and West directions. Driving the routes a head of time can determine the best ways of arriving at the determined location. Meet up spots outside the affected areas if a family is separated and not traveling together. Designate person outside of the area as a primary contact for the family. If there is time, shut off main gas valves to the home. Evacuating a Community – Community evacuations normally provide a person with more time to prepare their homes and collect belongings, but this is not always the case. The faster a person begins traveling to their destination the better chance of dodging traffic and any unnecessary stressful situations. If a person can evacuate before a mandatory evacuation has been announced, the better off they will be. Plan the evacuation – Have maps on hand with the planned route already made. Have a Plan B – In the event that certain roads are closed, have an alternate evacuation route. Have a place to meet – If a family is not all together when an evacuation is ordered, having a predetermined meeting place will allow the members to reunite and travel to their primary location. Make sure each of the family members knows the meet up spot. Choose a location to stay – When evacuations are ordered, some go to hotels to wait the disaster out, some flee to family or friend’s homes that are outside the affected area. Where ever that location is, make sure that if need be, staying there for a longer amount of time is alright. If a person goes to a hotel, bring extra money in case staying there longer is needed. Is there a reliable form of transportation? Are there properly mapped out routes? What is the emergency evacuation procedures for children’s schools? Will they be taken somewhere else? Can you get them? Is there a full tank of gas (and extra gas if needed)? If there are possible dangers or bad weather elements, can a person stay safe and protected? Is there an alternate route or escape route? Leave early enough to avoid any traffic. If possible, try to stay off of main highways feeding into the city. Sometimes walking is the only option. Perhaps the person or family has no means of transportation (a frequent lifestyle for city dwellers who rely on public transit). Alternatively, traffic could become completely gridlocked or your vehicle could become disabled. What is the route that will be taken? What is the distance family members will be able to walk each day? Does this account for any possible extreme terrain? Where will each person sleep? Does each person have a method of signaling in case of emergency? Have you accounted for the extra food and water that will be needed to compensate for the extra needed energy from walking? Do you have the appropriate clothing and footwear  for the terrain and climate conditions? Are you able and prepared to defend yourself against trouble that could occur from other evacuees? Many evacuation shelters do not accept pets, so plan accordingly. Preparing a 72 hour pet kit  will keep the pets as safe as possible. For some more tips on pet preparedness, click here . Evacuating from your home can be a very stressful situation, especially for those who are unprepared for this possibility. Following the correct protocols by having a family emergency plan , a decided meeting place, pre-established traveling routes and maps can help alleviate some of the tension in this situation.